So How Do You Help Your Child Prepare for These Important Assessments? Make text-to-world connections. One of the things test administrators and graders look for in the writing section is the ability apply knowledge to the real world. By illustrating to test scorers that they thoroughly understand the topic and can elaborate on it, they will achieve higher scores on the writing section. Practice with your child by having them write detailed descriptions of something that applies to the real world. Give examples from the real world to back it up and support their views. Use descriptive language. Great writers know how to use descriptive language effectively. Ask students to go into detail and depth regarding any subject they plan to write about. Practice by giving them a topic, such as a favorite hobby. Have them then write a paragraph or an essay detailing how someone could try that hobby. They should include materials needed, setting up a hobby area and results to expect. 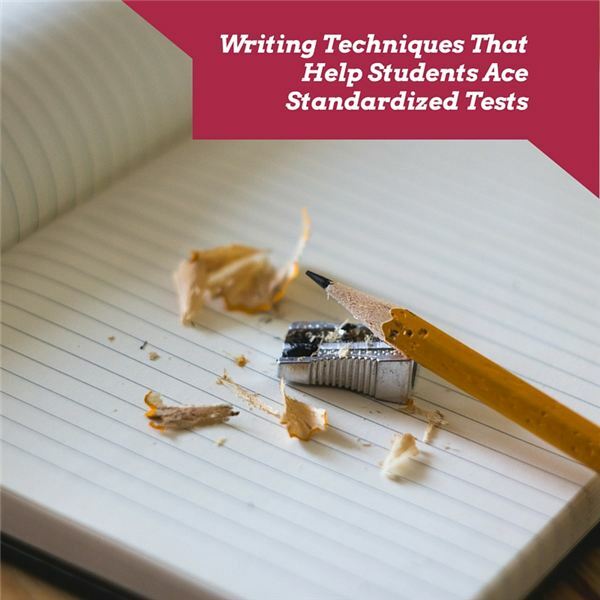 Repeated exposure to detailed writing will greatly increase their chances of success on the writing portion of the standardized tests and will increase their ability to communicate in writing. Practice answering difficult real-world questions. One of the most common techniques of testing is questions that students must answer with detailed responses. Make up questions that involve world events, things in the science or political world, or even everyday ideas. Ask students to elaborate and write about them in essay form. Their ability to answer questions in an intelligent and logical manner has a lot to do with their writing score and their ability to communicate this on paper. Familiarize yourself with figurative language. While some questions asked on the formal assessments have more to do with world events or scientific discoveries, sometimes they focus on the literary arts. The more familiar your child is with such terms as “onomatopoeia," “metaphors," “similes," and “hyperboles," the better they will be able to write about the use of these figures of speech in their essay. Use examples from nature to enforce these skills, such as, “That boy is as tall as a cornstalk," or “I’m going to eat everything in the house," to illustrate how we use these in everyday language. Write supporting details to back up statements. Being able to support what you say is considered an excellent writing technique. Test scorers want to see that students can make statements that they can back up. The evidence for the statement should be based on real-world facts and ideas as well as their own personal perspective. Good writers don’t just write about facts: they elaborate on them via both their own experience and opinion. Unless it is specifically stated to use facts only, it can be assumed that it is for the purpose of expressing the student’s individual ideas on issues that matter. These are a few ideas that parents can implement to help their children achieve a higher level of success on upcoming standardized tests. The writing assessment has become an all-important feature of the test, both statewide and nationwide. Research shows that students need to work on their ability to communicate in writing using coherent cohesive sentences and excellent grammatical structure. More importantly, they should feel free to express their views via the avenue of written text and show the test scorers that they know what they are talking about. This is likely a reflection, at least in part, of the need for “specialists" in our changing world. With time, they will build confidence to be able to do this on a higher level and you should see an increase in their scores on the state and national writing assessments. This is important for their future, as being able to communicate effectively in writing is one of the best predictors of success for college and beyond.